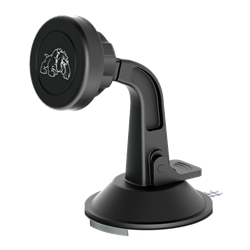 SCT's Magnetic Windshield Mount is not your average device mount. The mount's heavy duty suction cup base securely adheres to windshield glass while 4 ultra-strong neodymium magnets ensure your device stays front-and-center, no matter what terrain you're on. An included 90° HDMI elbow not only eliminates potential strain on your port, but it also ensures your wires stay tucked perfectly for the cleanest setup around.